Tap games, also known as increment games, have dominated Google Play. The very short game sessions allow these tapper games to fit into any period of boredom. Because of the popularity of these games, finding a tap game that offers you fun while allowing you test your tapper skills is not very easy. However, luckily for you, we decided to help you and we discovered one incredibly exciting tapper game with addictive action gameplay. Let’s see what the game has to offer you. This is an exciting and highly challenging action game that is easy to play, suitable for anyone that likes to test their tapper skills. In this game, players will have fun and enjoy the amazing colorful design with entertaining sound effects while they try to move the ball high and overcome the barriers on their way. 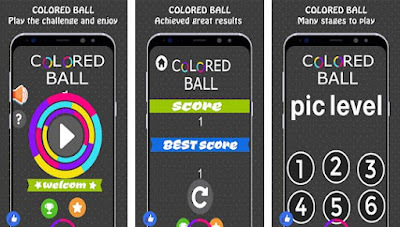 Players need to get the colored ball through the same colored parts of the moving circle while winning scores for their fast and precise skills. The gameplay is simple and yet addictive pushing players to react fast to progress. 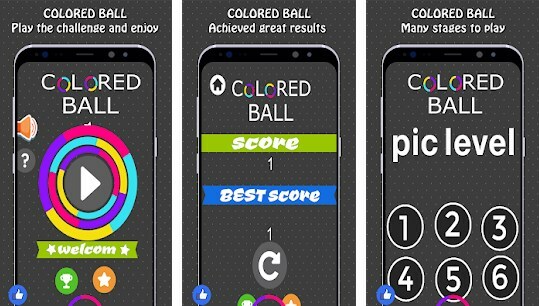 The Colored Ball Action is offering its players to challenge their tap skills while having a lot of fun tapping and moving the ball. In this game, players have only one task to fulfill and that is to tap the ball in order to overcome the barriers. Players must put the colored ball through the parts that are the same colored of the moving wheel. With reacting fast and precise, players need to be careful because if the ball hits a wrong colored obstacle the game will end. With getting the ball higher as possible and staying in the game as long as possible, players will get high scores for their skills. This tapper game has to offer 6 different levels and players can choose the level they like to challenge themselves. With progressing in the game and completing all the levels, players will get their chance to become the ultimate tapper while winning a lot of achievements for their tapper skills. Download this game for free on Google Play now to tap the ball and overcome the barriers!